There’s no place like California! The sun shines all year round, the people are welcoming, the parties are insane, the food scene is absolutely incredible, and on top of all that, there’s the stunning beaches and vibes that only a place like Cali can give you. Today we want to take you to one of the most amazing Californian destinations: San Diego. Like the rest of the U.S, the choice of hostels is quite limited, which is why we want to show you only the very best hostels in San Diego. It’s not a cheap destination, but it’s too beautiful to be missed. The land of waves and surfers awaits, but first, we are here to help you choose from among the best hostels in San Diego, found both on the coast and in the heart of the city. During the day you can explore the city itself, wander around Embarcadero – the beautiful waterfront full of shops, cafes, restaurants – all with an incredible view across the bay to Coronado Island. Chill in La Jolla, the spectacular coastline village, while you watch surfers doing tricks trying (and succeeding) to impress the people sunbathing on the shore. When the sunset comes, pack up a picnic dinner and gather around a bonfire on the beach, toast marshmallows and sing typical Californian songs, then stargaze until your eyelids are heavy. Do you want to experience Californian life and vibes? Eat a vegan burrito while trying to spot celebrities? Or maybe chill in one of the best hostels in San Diego? Keep on reading, as we have hostels that will make you fall in love with the city and its laid-back lifestyle even more! Probably the most colourful and lively hostel you could stay at, USA Hostels Ocean Beach is definitely one of a kind! This hostel is too good to be true, we had to include it in the list of the best hostels in San Diego. It’s two blocks away from the beach and they offer a free shuttle to the city’s highlights – even though Hostel team will try and convince you to spend the day hanging out with them on the beach! In fact, you’ll just need your swimsuit and flip-flops… they’ll take care of the rest, renting umbrellas, towels, chairs, and surfboards. Plus, the hostel is surrounded by shops, restaurants and trendy coffee shops. USA Hostels Ocean Beach has a unique vibe, very chilled with its amazing common areas where you can meet fellow travellers, or enjoy your free breakfast (bagels and all) and if you are feeling stiff just join one of their yoga classes! Book Ocean Beach Hostel now! Book San Diego Downtown hostel now! Are you a classy backpacker? If yes, then this is the perfect place for you! Freshly renovated with a cool design, this hostel pays attention to the details. HI San Diego has a cool vibe and can be found in a great location – downtown! The staff are very friendly and always ready to help you enjoy the city; the hostel also offers weekly free (or almost free) tours and activities. The location is so central you’ll find everything at walking distance – not very common in the U.S! Book HI San Diego Downtown hostel now! Located in Little Italy, ITH Adventure Hostel is the perfect place to start your San Diego adventure. This hostel will provide all the amenities that a backpacker needs and more. It’s one of the best hostels in San Diego because of the way it creates unforgettable experiences through amazing activities – the best way to get to know the city and its culture. This Victorian building has an amazing outdoor space where you can connect with people from all over the world over free breakfast! Book ITH Adventure hostel now! If you are coming to San Diego to relax, this super cute hostel in Point Loma (2 miles away from Ocean Beach) is the right one for you. The hostel’s atmosphere is very relaxed and you’ll also find an incredible backyard with table tennis, a gas BBQ and a fire pit. HI San Diego – Point Loma organises many events and activities, such as yoga classes, Taco Tuesdays, pub crawls with free transportation! Take my money, please! Book HI San Diego Point Lima now! This is definitely one of the best hostels in San Diego if you are planning on surfing. Located at Pacific Beach, you’ll have the chance to enjoy free breakfast on their outdoor deck while looking out the waves and soaking up the sunshine. The surfer/backpacker vibe, the oceanfront, the friendly and helpful staff are what makes this place one of the best hostels in San Diego. This place is pretty unique with its zoo themed building. ITH Zoo Hostel is an awesome place that will feel like a home away from home. Enjoy free breakfast and free pizza offered by a nearby Italian restaurant and amazing common areas where you can meet new friends. The staff are very friendly and they will make you feel like a local by showing you the best places to visit in San Diego and offering activities like surfing, free sailing tours, sightseeing, pub crawls, snorkelling excursions and so much more! Book ITH Zoo Hostel Now! We hope this list of the best hostels in San Diego will help you find the perfect match for your Californian trip! 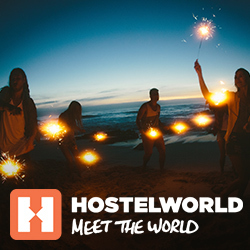 Let us know in the comments if you stayed in one of these amazing hostels!